I can hear you calling in the dead of the night, behind a moon bounce, waiting for the light. 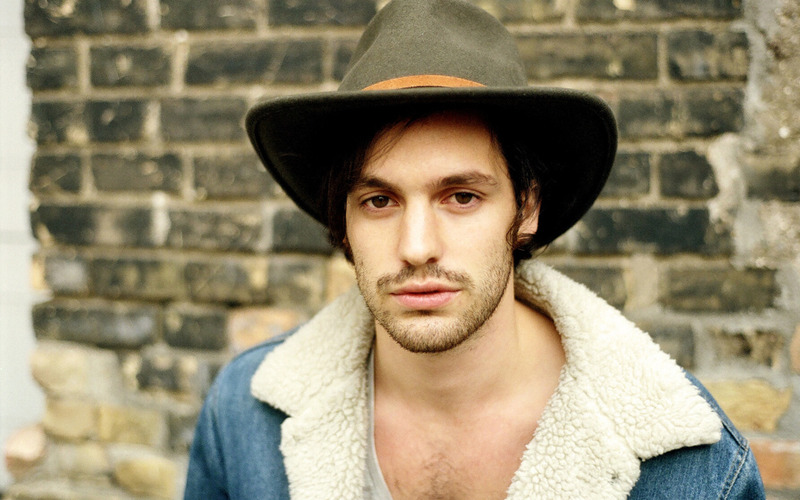 Los Angeles based singer-songwriter and multi-instrumentalist Robert Francis has been active in the music scene since 2007, when he released his debut album One By One on Aeronaut Records, however his infatuation with music goes back much further than that. Family friend Ry Cooder gave him his first guitar at age nine and seven years later, the Red Hot Chili Peppers' John Frusciante accepted Francis as his only guitar pupil. His musical talent is also influenced by his father, who was a classical record producer and pianist, his mother and aunts who sang Mexican Ranchero songs, his brother who is a Hare Krishna, and his two sisters who played in LA rock bands. His second album, Before Nightfall, was released on Atlantic in 2009. His latest release, Strangers in the First Place, is his first album with Vanguard Records and debuted in May 2012. While most children of the '90s were playing with pogs, Super Nintendos, and Stretch Armstrong dolls, Robert Francis was playing with guitars, banjos, and pianos. And it's no wonder, considering the musical family that Francis grew up with—his sisters play in rock bands, his mother's family is known to get together to sing Mexican Ranchero songs, and his father was a classical record producer and pianist. The Los Angeles-based musician received his first guitar at the age of nine, from family friend/legendary slide guitarist Ryland Peter “Ry” Cooder, but it wasn't until 2007 that Francis released his debut album, One By One. This was followed by 2009's Before Nightfall, and a seemingly endless amount of time on the road. Today, Francis releases his third album, Strangers In The First Place. Songs like “Gualala” and “I Sail Ships” were inspired by striking seaside landscapes in Northern California, where Francis wrote many of the songs on the album. Read on to find out why Francis is so inspired by his home state, how he had to combat the distraction of Netflix while writing Strangers, and how he once shared a stage with Chaka Khan when he was ten. Band of the Day: Question: Is there a particular location that you feel most connected to, musically? Robert Francis: Yeah, I would say California is an inspiring place to be. I'm from here, I know it extremely well. Oftentimes living in LA becomes too pressing [for writing music], there are too many people around, and I'm too close to my friends and family. If I can't get away here by driving down the coast, even to Malibu, what I'll try to do is pack up the car, grab my dog, and go up north. I've been spending a lot of time up north, especially writing the new album [Strangers In The First Place]. I wrote in Gualala, CA, which is about 3.5 hours north of San Francisco. Up north there's a few amazing places, like Gualala, Bolinas, and Trinidad, so I did a lot of writing up there. Band of the Day: In what kind of environment, like a cabin or hotel? Robert: In Bolinas, I stayed in a little cabin by the beach. In Gualala, I was in a seaside motel overlooking the Gualala River, which opens into the ocean. The house I stayed at in Trinidad was overlooking a river as well. Band of the Day: Did you completely isolate yourself from people while writing this album? Robert: I have a few times, sometimes I find it easier to write alone. But sometimes when I'm alone I actually find that I can be more distracted than when I'm with people. Like when I went to Bolinas the first time, I was trying to write and I couldn't, nothing would come out. So I thought, “well I might as well treat this just like a vacation,” so I went on Netflix and ended up watching like five seasons of '24' [laughs]. Sort of towards the end I was like, “what am I doing?” so I had to turn off the Netflix and unplug the internet and focus. But sometimes it's great, like in Gualala and Trinidad, at one point I had my sister, her husband, and a friend with me. And at another time I had a girlfriend at the time with me. It almost becomes easier [with other people around] because I don't want to be too in my comfort zone. Band of the Day: When you're feeling distracted, how do you go about trying to clear your mind or focus when writing a song? Robert: The best way to do it is to develop a routine. If I can go to bed at a certain time, wake up in the morning and have a cup of coffee at a certain time, maybe sit outside in the sun and try to relax for 5 or 10 minutes, or walk my dog, or whatever routine I've developed over time. But being a musician and trying to abide by this lifestyle that has no routine is extremely difficult, because I never know what I'm gonna be doing, or where I need to be in any given moment. Someone can just call and say, “oh you gotta leave, you're going to Europe today.” That can kind of throw everything off. And as a musician, one can be susceptible to not taking it easy, or going out every night and going drinking, or hanging out and getting distracted. So the best time to be cleared and focused is when I've had this routine, and I can sort of sit down and start writing. You start with a line, you pull that line out of nowhere, follow its lead, and all of a sudden you create a song. Band of the Day: Because you spent so much time by the seaside, does the water imagery come into play with particular songs on this album? Robert: Yeah, “I Sail Ships,” and “It Occurred To Me”, and “Dangerous Neighborhood.” With “It Occurred To Me,” the lyric subject is mainly about one growing up and perhaps submitting yourself completely in a relationship and having it go completely awry. And in that process, the only safe place one can go is to those memories of the mind, like of childhood. In the song, there's these images of like children chasing down the sun, playing where the grunion's run, you know there's like thousands of fish in the shore, and all these memories of childhood that have to deal with the ocean, and ships as well. You know up there, in the northern tip of California, it really feels like it's untouched, you can really imagine what it was like maybe hundreds of years ago. So I've always found that really inspiring. Band of the Day: Speaking of childhood, because you've been playing music since such an early age, do you ever feel a disconnect with your peers? Robert: It's funny 'cause the more I tour, not to say that I'm jaded, but I think I don't necessarily get as excited as some of my peers do, who are really excited to play a show or jam at this place. So that can be a bit of a negative sometimes. But music is really the only thing that I've consistently followed through with, and have really understood, and I feel like a really, really deep connection with it. Music is very, very special to me. I take it very seriously, and my teacher, Ry Cooder, passed down a lot to me. His teacher was [blues/gospel musician] Reverend Gary Davis, and he's one generation away from slavery, so it feels like there's this tangible—not that I can ever touch Reverend Gary Davis or Ry—but it feels like there's this tangible thing has been passed down that I've been extremely fortunate to have the opportunity to understand. It's very important to me, and I wouldn't trade it for the world. Band of the Day: What would you say is the very first meaningful music experience that you can remember having? Robert: When I was a little kid, ten or something, I used to always go with my sisters to The Mint, this club in LA. They're ten years older than me, and they'd be playing all the time with their band, and I'd go and sit in this big booth and watch them. One time I was playing guitar outside while they were loading in, and Harry Dean Stanton, an actor from one of my favorite movies 'Paris, Texas', was playing with his band. His guitar player came out and saw me playing and thought it was pretty funny 'cause I was so little. During their encore, he invited me onstage, dropped a Gibson hollow body around my neck, and I started playing a solo. I looked up, and there was Harry Dean Stanton up onstage in a white three-piece suit, holding like high ball glass of scotch, playing the blues. Then Chaka Khan came onstage and started wailing, and she was on her knees singing to me, while I was taking a solo. Up until then you sort of play music, learn your instrument, but you never really know what it's for until you can truly apply it for the first time. So that was the first time I really applied myself. Band of the Day: Would you say you have a pretty different persona onstage versus offstage? Robert: Yeah I think probably the underlying persona would be that I can tend to be a pretty awkward person sometimes, the things I come up with and say on stage. I think when fans meet me they expect me to be this brooding, very serious character or something 'cause all the songs tend to be intense. So I think they're always surprised that I'm kinda shy and smiling I guess. On stage I can pull off a more serious demeanor [laughs]. Band of the Day: What's one of the biggest struggles as a musician that people wouldn't necessarily think of? Robert: I think one of the hardest struggles for me is having success overseas, seeing where the music can go and how it can affect people in a much broader way [like in Europe], and basically comparing it to here. I remember playing sold-out shows to 2000 people in Europe, where people knew every lyric to every song and they speak a different language, then I'd fly back and sleep on my parent's floor and play to seven people at a bar in LA. So that juxtaposition is frustrating, because it started getting me thinking too much about success, which I had never intended in the first place with my music. So that's a struggle, to not let any of that get to your head. To just keep it about the music and be as real as you can with yourself. Band of the Day: So in that case, what defines success for you? Robert: Honestly, it's just about connecting with people. If I can have fans and reach people, and just play music for people, that's what life's about for me. I think all the stuff that sort of surrounds it, whether it be money or that kinda thing, that stuff doesn't matter if you don't have a true connection with your fans. Band of the Day: Do you have a specific example of something a fan said or did? Robert: Yeah, there's a woman who came to a show, she's a little bit older, and she said she was on her way out. She was having a hard time, struggling with a few different things that could've led her down a darker road, and she was ready to give up on life. She said when she heard my very first record, One By One, it made her rethink her life. And then she pulled up her sleeve and she had the chorus of “One By One” tattooed on her arm. And she was like in her mid-50s or something. That was about 3.5 or 4 years ago, and every now and then there's someone who says something like that and it just gets me. Band of the Day: If you had to sum it up, what would you say is the proudest moment of your career so far? Robert: I would say when we did my first headlining tour of Europe. I paid for everything myself, paid the band well, broke even, didn't make or lose money, but got to go everywhere in Europe. All over France, Germany, Switzerland, the Netherlands, Belgium...seeing all these new places, playing sold-out shows, being with my best friends who were in the band with me, was like a dream come true.